How Much Should You Spend on Tools for Websites? When it’s time to build your website, a custom domain name along with a hosting plan are the basic tools you should invest in if you want your site to look professional. One of the easiest ways to do this is by using WordPress.com. You will get a free custom domain name with one of the paid plans, and have your hosting needs taken care of without worrying about the technical aspects of maintaining a website. Aside from the basics mentioned above, there are a few additional tools which many people invest in to create better websites. While there are ways to create DIY branding, it’s not something you should skimp on. A brand is what makes your business recognizable to visitors and customers, and sets you apart from the competition. If you’re confident in your design skills, take a shot at creating your own logo, color scheme, and other branding assets. But if not, professionally designed brand elements can be wise investments. Themes control how your site looks and displays information. Many site owners opt to use premium themes, but this isn’t always necessary. Ultimately, the choice between a free and paid theme comes down to your website needs. 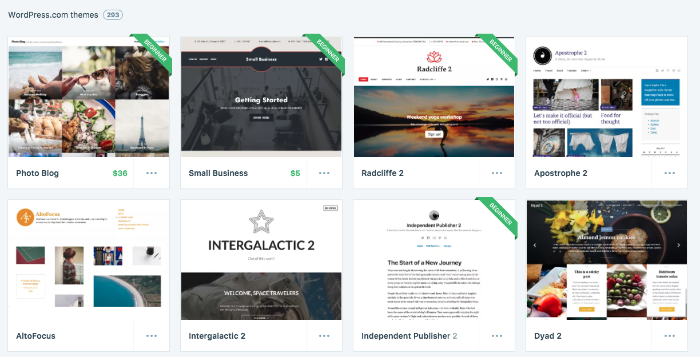 WordPress.com offers hundreds of free and premium themes that are comparable in features and suitable for both business and personal users. You’ll find free themes that allow you to display your business hours, contact information, and testimonials in the same ways you would with paid themes. If you can find a free theme that suits your needs, there’s no need to invest in a paid one — especially if you’re just getting started. Plugins give your site extra functionalities. Some offer basic features for free, while others are available through paid plans. You can install plugins for social sharing, email newsletters, contact forms, sliders, and much more. WordPress.com allows you to install plugins, free or paid, if you’re a Business plan user. Backup plugin — Having a regular backup in place is a must. This will ensure that you can always restore your website and prevent any potential downtime should something go wrong. Luckily, WordPress.com handles all backups for you. Security plugin — On a similar note, a security plugin will minimize the chances of your site being hacked, prevent brute-force logins, and reduce the amount of spam in your comments section and contact forms. Again, choosing WordPress.com means that all basic security needs will be taken care of, but you could add on an additional security plugin if you’d like. Plugins that covers multiple features — A plugin that has multiple features, like the Jetpack plugin for WordPress.com, allows you to avoid installing several different plugins, which makes your site easier to use and maintain so you can spend more time growing your business. If you want your website to quickly gain traction, maintaining a regular blog is a great way to get your site noticed. But running a blog can be time-consuming, especially if you want to produce a lot of content. Hiring a freelance writer is one of the best investments you can make for your website and business. By outsourcing your content writing, you can spend more time developing new products or services and promoting your website. What tools should you start with? When it comes to building a great website that attracts visitors and turns leads into customers, it’s worth investing in tools for websites and services that go beyond the basics. What you ultimately choose to invest in depends on your site and its needs. Custom branding, plugins that enhance your site, and assistance from content writers might all be wise investments that will free up your time and allow you to focus on promoting your website so that you can get the best return on your investment. Previous PostWhat Is Taxonomy, and Why Does It Matter?